The CM4043 is chambered in a .40 S&W caliber, has a 3.0″ barrel and an overall length of 5.47″, with a height of 4.0″. The pistol weighs in at 15.8 ounces plus 1.9 ounces for the stainless steel magazine. 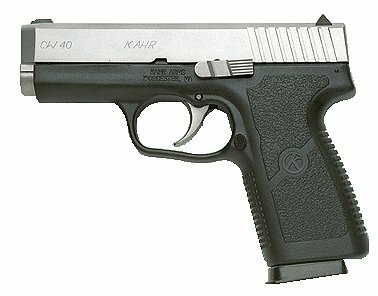 Differences between the CM models and PM models include: the CM4043 has a conventional rifled barrel instead of the match grade polygonal barrel on Kahr’s PM series; the CM slide stop lever is MIM (metal-injection-molded) instead of machined; the CM series slide has fewer machining operations and uses simple engraved markings instead of roll marking; and finally, the CM series are shipped with one magazine instead of two magazines. You are currently browsing the archives for the Kahr category.